Over the past week I've been following an Unreal Engine tutorial to make a Twin Stick Shooter (here's the link). The instructor is awesome and injects a lot of fun and humor into the lessons, which really helps the information stick. It still feels sort of weird to share work that was basically done by following a series of videos, but I'm really happy with the result and hope that it will inspire some of you to take up some new hobbies and side projects. If there's one thing I've learned from this it's that tutorials are a lot of work, and you should feel proud of what you create from them. Even if you're just following along, you're learning and developing new skills. The Unreal Engine interface is pretty wild, and not really in a good way. If you worked on the Unreal UI and you read this, I'm sorry but it is difficult to look at in a web 2.0 kind of way. 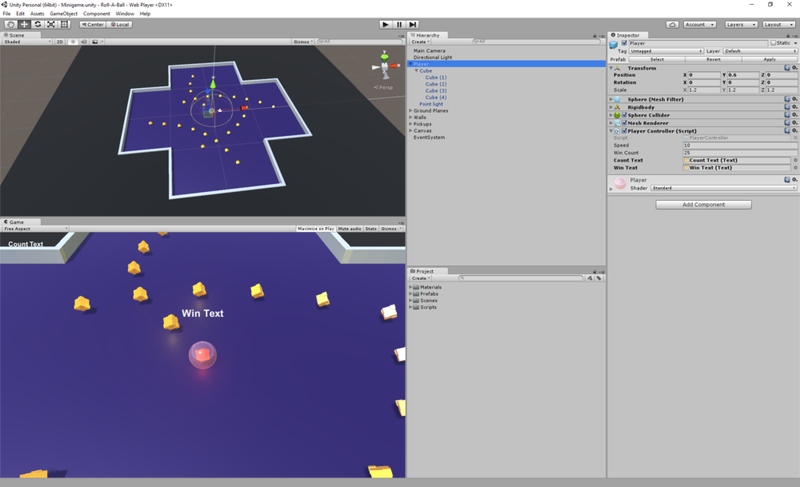 Unity is comparatively clean and minimal, albeit to the point of being kind of boring. Unreal is full of 3D icons with colors and drop shadows all over the place. I get that it's a 3D game engine, but does it have to be so distracting? I'm seriously considering doing a redesign of some of the interface screens as a side project just to see if that would improve the usability. Anyways, here's some screen shots. If you are interested in playing the game, you can download it here for Windows, and here for Mac. It's meant to be played with a controller - left stick to move, right stick to turn the character, right trigger to shoot - but you can use a keyboard - W, A, S, D to move, arrow keys to look, and spacebar to shoot. Also, be warned that the application seems to hide the cursor, so you may need to Alt+Tab out of it to quit. It's not terribly advanced. I'm sure some of you are wondering why I've now shared two games in two weeks. The answer is that I have some ideas for VR (virtual reality) games/experiences that I would like to be able to prototype. Those of you who work with me know that I think AR (augmented reality) is going to be the next big thing, and will ultimately replace our phones and mobile devices once the technology improves**. Since it's not quite there yet, VR serves as both a stepping stone and a sister technology. I feel like I could write a whole post about this, so I'll leave it at that. Anyways, I've got a very busy week coming up so don't expect another game next weekend, but hopefully I'll start on something new by then. Until next time, thanks for stopping by! *Unity and Unreal are two different game engines. Think of these as programs like Photoshop that you use to build games. There are differences between them which mostly seem like how pretty the games look, but in theory you can make the same styles of games in both. If you're interested in making 3D games, I recommend trying both Unreal and Unity and seeing which you prefer. If that seems overwhelming, there are also programs like Gamemaker for 2D sprite games, which I've also worked on.